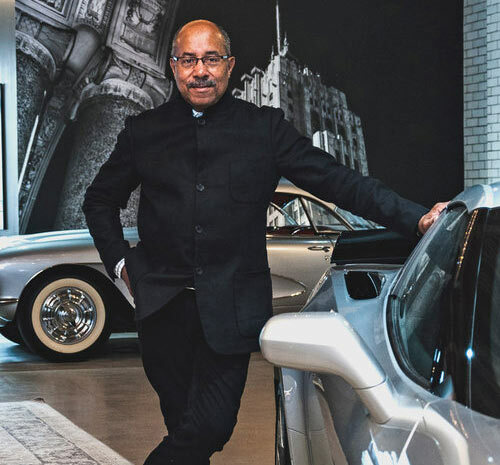 A group of top automotive designers has selected Ed Welburn as the recipient of the 2018 Lifetime Design Achievement Award for his outstanding career in vehicle design. The award, given annually by the Detroit Institute of Ophthalmology (DIO), is unique in that the selection is made by the previous winners of the award. This group includes Chris Bangle, Nuncio Bertone, Wayne Cherry, Walter de’Silva, Willie G. Davidson, Tom Gale, Giorgetto Giugiaro, Chuck Jordan, Robert Lutz, Syd Mead, Shiro Nakamura, Patrick le Quement, Sergio Pininfarina, Stewart Reed, Peter Schreyer and Jack Telnack. Called “the man who brought beauty back to GM,” Welburn was just the sixth head of design for General Motors. He was also the first to lead the division on a global level, placing him in the same company as such design legends as Harley Earl and Bill Mitchell. During his 44-year career, he oversaw many designs, including those for the Corvette, Cadillac Escalade and the revived Chevrolet Camaro along with such concept cars as the Oldsmobile Aerotech, the Cadillac Ciel and the Buick Avista. Welburn decided early on that a career in automotive design was for him, sketching cars as a young child and writing his first letter to GM when he was 11. The company responded, and he followed their recommendations, studying design, sculpture and painting at Howard University’s school of fine arts, which led to a college internship with GM in 1971. One year later, he became the first African American hired to design vehicles at GM, and he’s never looked back. Besides creating the striking cars mentioned above, he also designed several pace cars for the Indianapolis 500 and the most recent presidential limousine. He has also driven laps at such famed race courses as Monza, Laguna Seca, Le Mans, Indianapolis, Goodwood and Mid-Ohio; is a judge of classic cars for the Concours d’Elegance at Pebble Beach, Amelia Island, Hilton Head Island and the Peninsula Classic, and also designed the new trophy for the North American Car of the Year award. In 2016, GM dedicated its Center for African American Art at the Detroit Institute of Arts in Welburn’s honor. In 2017, he was inducted into the Automotive Hall of Fame and was awarded an honorary doctorate of fine arts by the College for Creative Studies in Detroit. Since his retirement from GM in 2016, he’s launched The Welburn Group, a design consultancy. He also continues to advise GM Design on their new facility in Warren, Michigan. The 2018 Lifetime Design Achievement Award will be presented to Welburn at Vision Honored, a black tie event on June 15, 2018 as part of the DIO’s EyesOn Design activities which culminate in their annual automotive design show, held every Father’s Day on the grounds of the lakefront Eleanor & Edsel Ford House in Grosse Pointe Shores, Michigan. Tickets to attend Vision Honored will be available on this website in the spring of 2018.